Iran is said to be building new long-range ballistic missiles at a Syrian weapons factory identified by the United States as developing non-conventional weaponry, according to regional reports alleging that Russia and North Korea are aiding in the endeavor. The Syrian opposition news website Zamanalwsl.net recently published multiple reports and pictures of a weapons factory in Syria that it claims is under direct control of Iran. The reports appear to confirm other recent news articles indicating that Iran has begun manufacturing advanced missile technology in Syria with permission from embattled President Bashar al-Assad. The reports claim that Iran is constructing long-range ballistic missiles in a factory operating under the Syrian Scientific Studies and Research Center, which the United States had identified as the key government agency behind the country's contested non-conventional weapons work, including chemical weapons. Assad is reported to have visited the Iranian factory recently, where he met with Iranian and Syrian weapons experts, according to a translation of the articles conducted by the Middle East Media Research Institute, or MEMRI. "The facility is producing long-range missiles as well as M600 ballistic missiles, which are a Syrian version of the Iranian Fateh 110 missile," according to MEMRI's readout of the report. 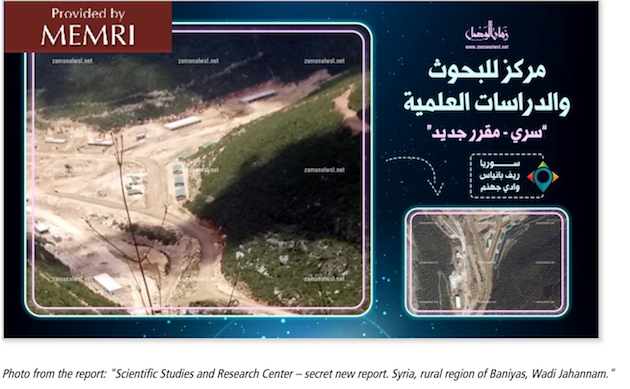 "This facility has a branch in western Hama province for producing chemicals, and that that there is a Russian military base in the region, where North Korean officers once served." The facility is said to be shrouded in secrecy, despite evidence that agents from Russia, North Korea, and Iran are freely moving around the site.